Really this couch is called the Aster Papposus Sofa, but who knows what the hell an aster papposus is? I can't even pronounce those words together, and have just resorted to reading them as Snuffleupagus. To whom the couch also bears a vague resemblance. So that's the first thing. I gave it a new name. 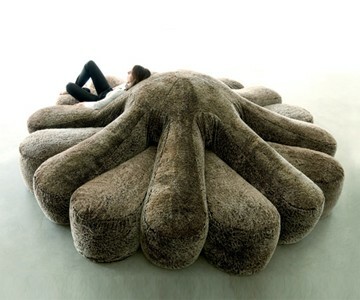 I selected Octopus Couch because it appears to have 8 tentacle-y arms cascading from its spherical center. The second thing is that it was designed by the Campana Brothers, and those guys must be some HOT. SHITS. 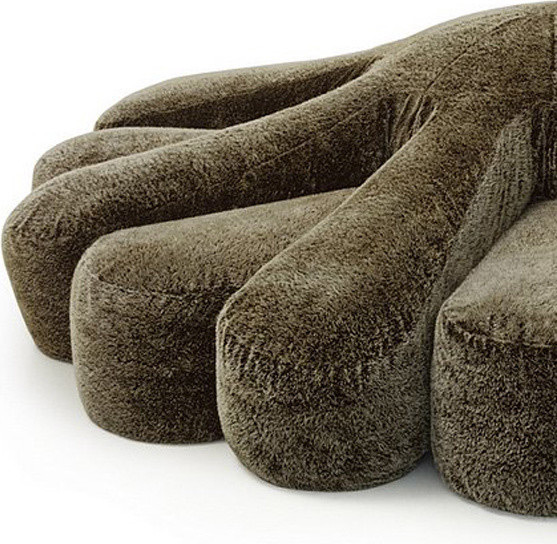 because Octo Sofa here costs over $70,000. That's even more than the Fletcher Capstan expandable table, which at least does hypnotic geometrical tricks to earn its price tag. And even it ranks as way overvalued according to Dude reader Difdi, who is responsible for one of my favorite product comments ever: For $70,000 I'd expect it to transform into Optimus Prime, not just get bigger. Agreed. In the same vein, in exchange for my next 5 years of allowance Aster Papposus better be able to come to life as the Kraken and do my bidding for me. On my command, not just when no one else is looking like Kim Cattrall did for Andrew McCarthy in Mannequin. Aster Papposus is made of two identical polyurethane and feather-filled pieces fitted together to form the couch before us. The manufacturer states that it is amazingly comfortable, with no rigid frame, and if the third photo above with that lady lying all naked and sprawled across it is any indication, I would say that statement is accurate.